A region where Gazprom has no presence as yet has signed its first agreement with the state gas monopoly, to connect local population centers to gas mains. In future this could develop into closer cooperation as Gazprom could channel its gas export flows through the region. Zabaikalsky Territory governor Konstantin Ilkovsky tells RBTH how else the region could contribute to Russia's cooperation with Asia-Pacific countries. At the International Investment Forum in Sochi, we have signed an agreement with Gazprom. This is very important for us since the Zabaikalsky Territory is practically the only place where Gazprom is not yet present, with the exception of small supplies of liquefied gas for household needs. Now, having signed the agreement, we can become part of the Eastern Gas Program. 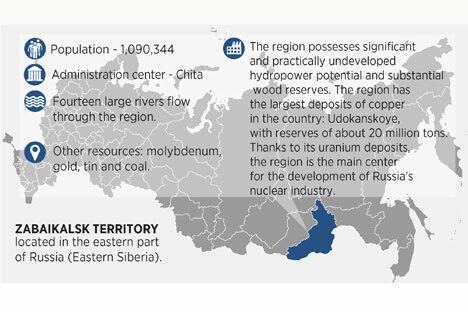 The Eastern Gas Program is aimed primarily at gas production in Russia's eastern territories. Its second main focus is the export of gas, the construction of trunk pipelines in the east of the country and the export of gas to Southeast Asia. There is also a third area, which in this initial phase is the most important for the Zabaikalsky Territory. Connecting local population centers to gas mains means a better quality of life and a better environment for small and medium-size businesses. To give you an example: If an area is not linked to gas mains, the average size of houses there is 40-50 square meters; if it is, houses are bigger, at 120-130 square meters on average. In addition, one of the issues we are trying to consider with Gazprom and the Russian government is the possibility of exporting gas via the territory of the Zabaikalsky Territory. Our region has one of the longest stretches of the border: some 2,000 kilometers, about 1,200 of which is the border with China. We border on China's northern territories, which the Chinese authorities are paying particular attention to in terms of developing business there. We aim to supply gas to those territories. The Zabaikalsky Territory has Russia's biggest border crossing point, Zabaikalsk, for motor and railroad transport. It accounts for nearly 65 percent of freight traffic between Southeast Asia, Russia, and Europe. I think it would be absolutely right to supplement it with a cross-border gas flow. Another promising area is the export of grain from Russia to Asian countries. There are several joint projects with China being carried out in the Zabaikalsky Territory. One of them is the construction of the Amazarsky pulp and paper plant. The expected amount of investment in this project is $1.2 billion; the Chinese side has already invested $400 million. The plant's main feature is that it will be using timber that is not in demand anywhere else, including wood processing waste. Its output will be exported. Another area for cooperation is the construction of mining enterprises on the border with China. These are based on two deposits: the Berezovskoye iron ore deposit, where construction is under way; and the Noion-Tologoiskoye polymetal deposit, where an ore-dressing factory has already been built and ore is being processed.